A classic sound achieved with an organ speaker and amplifier, rotary speaker effects have become an integral part of modern music. Featuring three different rotary speaker voices, including Fender's very own Vibratone effect, The Pinwheel makes it easy to add this swirling sound to your tonal toolbox. Switchable Slow and Fast speeds let you spin up the perfect sound for your music, while the onboard Overdrive adds some texture to your tone. The Sensitivity control allows modulation rate changes based on your playing dynamics—dig in and the effect gets more intense. 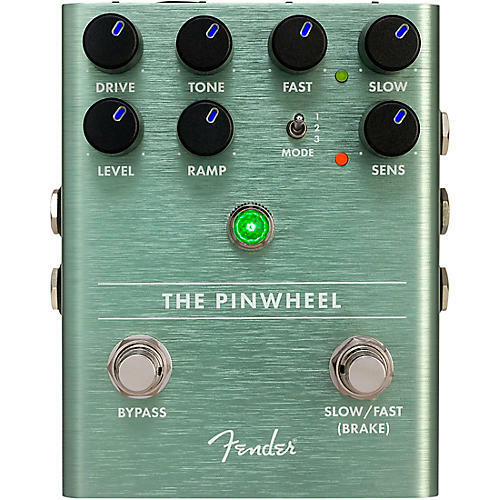 Designed by Fender's in-house team of experts, The Pinwheel Rotary Speaker Emulator is an all-original Fender circuit. To ensure this pedal is performance-ready Fender let musicians kick it around, took their feedback to heart and refined it. The chassis is crafted from lightweight, durable anodized aluminum, and the Amp Jewel LED gives your pedalboard the classic Fender look. The LED-backlit knobs show your control settings on a dark stage at a glance.